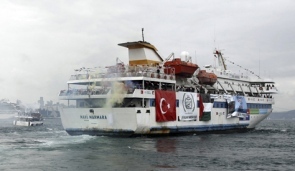 Haaretz reports today that Israel will attempt to block the humanitarian Freedom Flotilla heading toward Gaza. However, according to the Israeli paper, the humanitarian cargo would then be unloaded, inspected and sent to Gaza overland via the United Nations. Typical for Israel, it tries to win a lost battle. On the one hand, by stopping the flotilla Israel attempts to maintain its regional status as an omnipotent super power that controls the land, the air and the sea. On the other hand, the Jewish state pathetically also wants to evoke sympathy for being ‘sensitive’ to humanitarian issues and the Palestinian plight. The Israeli government fails to gather that the tide has changed. We see through them. We all know what the Jewish state stands for. We all know about the devastation in Gaza, we know about the siege, the destruction and the crimes against humanity. We all watch the Israeli separation wall cutting through Palestinian family's houses and olive orchards. We also follow the racist ethnic cleansing in East Jerusalem. The Israelis better save us from their spins and manipulations. In case the Israelis still fail to see it, they are dealing this time with an international flotilla that is sailing under Turkish and Greek flags, a fleet that carries 800 enthusiast activists from all over the world. The Israelis are dealing with peace lovers who are determined to break through the siege and deliver medical aid, cement, paper and food. On the deck we have 35 European parliamentarians who must have decided to say NO to Zionist fund raisers. This flotilla is a clear signal to Israel that the game is over. Israel is now all but officially isolated. All that is left for Israel is to come to terms with its true nature: a shameless racist, murderous and terrorist state. Militarily and politically Israel locked itself into a limbo. For the Israelis it is a “no win situation. The Israelis may have the military means to stop the flotilla from accomplishing its humanitarian mission. The Israeli Navy can easily block the flotilla's way, it can also impose an electronic blackout around the ships, such an act may lead to the loss of communication with the humanitarian mission. Israel would then have to act militarily. Yet, taking control over 8 ships and 800 activists armed with relentless will and backed by many cameras is not going to serve the Israeli interest. If Israel dare use force, this will backfire. We also have to bear in mind that this time the Turkish Government is closely monitoring the situation and openly supporting the mission. Israeli aggression at sea could lead to an evolving incident with some unpredictable consequences. Israel better give up on any attempt to stop the flotilla. On a further note, the Israeli Government and the Israeli people better start to come to terms with the fact that the game is soon to be over. The Zionist project and the Israeli state is in a state of moral bankruptcy. From that perspective the flotilla is not just a humanitarian mission, it is actually a reminder for all of us of the true meaning of humanism.